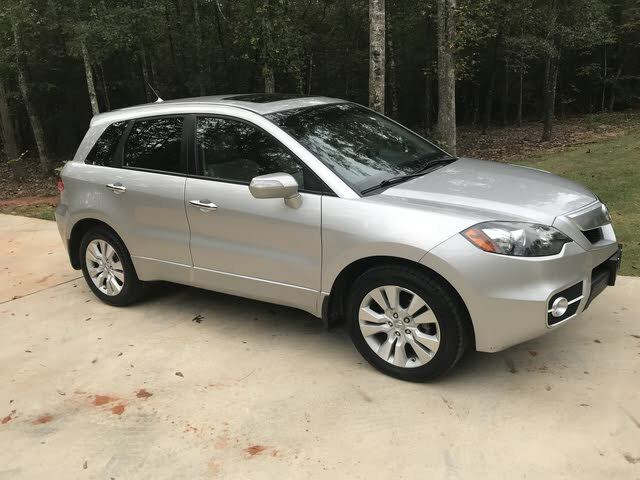 Small yet not overly parking-lot friendly, and with a dated look, the 2012 Acura RDX Base nevertheless offers posh, pizzazz and power for the budget-minded masses. Add to that some admirably shifty moves, turbocharged power and an attractive price, and this 5-seat, luxury-oriented compact crossover begins to gain a little stature. Toting 60.6 cubic feet of cargo space with the rear seats folded, as well as 18-inch alloy wheels, a power sunroof, heated power-adjustable mirrors and a rear spoiler on the outside, this posh little people-mover goes on to lever leather upholstery, heated power-adjustable front seats and full power accessories into its almost roomy cabin. Cruise control, telescoping tilt-wheel steering, a universal remote garage door opener and a rear-view camera add a ton of convenience, while the leather and simulated alloy steering wheel mounts redundant audio controls and paddle shifters and plays swell with the leather, wood and simulated alloy cabin accents. Dual-zone auto climate control, driver memory settings and an auto-dimming rear-view mirror begin the list of techno-bling aboard this admirable Acura. Additionally, look for Bluetooth hands-free calling to be embellished with a 360-watt audio system that boasts an MP3-capable 6-CD changer, 7 speakers, satellite radio, auxiliary iPod input and a USB port. The major option available to this cute ute is a Technology Package that features upgraded climate control and a navigation suite with 8-inch display and real-time traffic, as well as a 10-speaker Acura/ELS premium stereo. Remote engine start, meantime, as well as splash guards and a few exterior protection upgrades, as well as some added interior accents, are also available dealer add-ons. Giving the front-wheel-drive (FWD) 2012 RDX Base its go is a 240-hp turbocharged 2.3-liter inline 4-cylinder (I4) powerplant that flaunts all-but-obligatory variable valve timing (VVT). Under the management of the standard 5-speed shiftable automatic transmission, this blown four-banger puts out 260 lb-ft of torque and is rated to tow some 1,500 pounds of trailer with the proper equipment. Fuel efficiency, meanwhile, is a rather tepid 19 mpg city/24 highway. Notable standard safety features aboard the 2012 RDX Base again include 4-wheel antilock brakes (ABS), traction and stability control, front and rear head airbags, front side-mounted airbags and front head restraint whiplash protection. Further standard safety equipment includes daytime running lights, turn-signal-integrated mirrors, front fog/driving lights, high-intensity-discharge (HID) headlights and a remote antitheft alarm. For those who need the confidence of all-wheel-drive (AWD) traction on winter roads, Acura offers its 2012 RDX SH-AWD compact crossover. This luxury-oriented, 5-seat family mini-ute sports the 60.3 cubic feet of cargo area featured in its front-wheel-drive RDX siblings, as well as the same turbocharged power and posh standard goodies. Outside, look for amenities like 18-inch alloy wheels, a rear spoiler and heated power-adjustable mirrors to complement the power sunroof, while interior bling includes leather upholstery bolsters, heated power-adjustable front seats with memory for driver's settings and leather, wood and simulated alloy cabin accents. Full power accessories, of course, come standard, as do cruise control, telescoping tilt-wheel steering, a universal remote garage door opener and a rear-view camera. Meantime, the leather and simulated alloy steering wheel mounts redundant audio controls and paddle shifters, and again, all of this is chilled by auto climate control. Tech-wise, the 2012 RDX SH-AWD mirrors its less traction-heavy stablemate with standard Bluetooth hands-free calling and an auto-dimming rear-view mirror, as well as a 360-watt audio ensemble boasting an MP3-capable 6-CD player, 7 speakers, satellite radio, an auxiliary iPod input and a USB port. By far the most popular option for this high-end hauler is the Technology Package, featuring a navigation suite with 8-inch display and real-time traffic, as well as upgraded climate control and the Acura/ELS premium audio system sporting 10 Surround Sound speakers. If a few more accessories are needed, check out the available remote engine start, splash guards and various interior and exterior trim upgrades that can be added by the dealer. Standard power for the 2012 RDX SH-AWD is a variable-valve-timed (VVT) 2.3-liter turbocharged inline 4-cylinder (I4) engine that’ll put out some 240 hp and 260 lb-ft of torque under the management of a standard 5-speed shiftable automatic transmission. Look for mileage numbers that droop to a dismal 17 mpg city/22 highway in this AWD-toting crossover, but maybe its 1,500 pounds of towing capacity (with the proper equipment) might offset those wallet-spanking economy figures. In any case, the full-time AWD system allows the traditional 50/50 torque split in normal driving conditions, with power added to the outside wheels in tight turns for some smile-inducing handling attributes. When roads get slippery, meantime, the system automatically transfers torque from the wheels that slip to the wheels that grip to keep this luxury-laden ute on the straight and narrow. Notable standard safety features, finally, include 4-wheel antilock brakes (ABS), traction and stability control, front and rear head airbags, front side-mounted airbags and front head restraint whiplash protection. Secondary safety stuff, meanwhile, includes daytime running lights, turn-signal-integrated mirrors, front fog/driving lights, high-intensity-discharge (HID) headlights and a remote antitheft alarm. Add the gizmo-heavy Technology Package to Acura’s 2012 RDX Base to behold the RDX Base with Tech Package. This high-end 5-seat compact crossover not only totes the navigation suite and premium stereo system of the touted Tech Package, but flaunts the 60.3 cubic feet of cargo room (with the rear seats folded), not to mention the turbocharged power and head-turning handling of its less tech-savvy siblings. Features-wise, look for 18-inch alloy wheels, a power sunroof, rear spoiler and heated power-adjustable mirrors on the outside, with leather upholstery, heated power-adjustable front seats, full power accessories, and leather, wood and simulated alloy accents adorning the cabin. Cruise control, telescoping tilt-wheel steering, a universal remote garage door opener and a rear-view camera also come delivered in this cute ute, as do steering-wheel-mounted audio controls and paddle shifters, and it's all kept cool with state-of-the-art GPS-interfaced auto climate control added as part of the tech package. Standard techno gizmos include Bluetooth hands-free calling integrated into the standard Technology Package, with said package also boasting a navigation suite with 8-inch dashboard-mounted display and real-time traffic alerts. Additionally, this electronics-heavy RDX flaunts an upgraded Acura/ELS audio system with an MP3-capable 6-CD changer, 10 Surround Sound speakers, auxiliary iPod integration, satellite radio and a USB port. A few accessories, like remote engine start, splash guards and various interior and exterior trim upgrades also can be added to this little crossover. The ubiquitous turbocharged 2.3-liter inline 4-cylinder (I4) engine again powers the 2012 RDX Base with Tech Package and mates with the standard 5-speed shiftable automatic transmission for 240 hp and 260 lb-ft of torque. Despite the efforts of variable valve timing (VVT), this blown four-banger manages only 19 mpg city/24 highway. Should the need for towing rear its ugly head, this downsized crossover can manage some 1,500 pounds of trailer-toting capability with the proper equipment. Finally, standard safety equipment aboard the RDX Base with Tech Package includes 4-wheel antilock brakes, traction and stability control, front and rear head airbags, front side-mounted airbags and front head restraint whiplash protection. Additional safety stuff includes daytime running lights, front fog/driving lights, turn-signal-integrated mirrors, high-intensity-discharge (HID) headlights and a remote antitheft alarm. Boasting standard full-time all-wheel drive (AWD) and the touted Technology Package, Acura’s 2012 RDX SH-AWD with Tech Package gets the family directly to its destination through snow and mud with turbo-boosted intensity and with just the right touch of quasi-affordable posh. Boasting the Technology Package’s navigation suite, with its 8-inch display and real-time traffic alerts, GPS-enhanced auto climate control and 10-speaker Acura/ELS stereo upgrade, this luxury-leaning 5-seat compact crossover also flaunts a standard power sunroof, heated power-adjustable mirrors, a rear spoiler and 18-inch alloy wheels enhancing its handsome profile, as well as 60.3 cubic feet of rear-seat-down cargo-carrying capability. Cabin adornments, meanwhile, include leather upholstery, heated power-adjustable front seats with driver memory functions, wood, leather and simulated alloy cabin accents, full power accessories and an auto-dimming rear-view mirror. Once again the leather and simulated alloy steering wheel sports the ubiquitous telescoping and tilting feature, as well as mounting redundant audio controls, paddle shifters and cruise controls, while a universal remote garage door opener and rear-view camera contribute even more convenience. Finally, Bluetooth hands-free calling is integrated into the touted Technology Package, as is a 6-CD changer, Surround Sound, satellite radio, auxiliary iPod integration and a USB connection. Further available add-ons to this tech-heavy RDX include splash guards, remote engine start and various interior and exterior trim upgrades. A variable-valve-timed (VVT) turbocharged 2.3-liter inline 4-cylinder (I4) powerplant gives the flagship 2012 RDX SH-AWD with Tech Package its go. Combined with the standard 5-speed shiftable automatic transmission, the blown four-banger boasts 240 hp and 260 lb-ft of torque, with mileage figures estimated at a mere 17 mpg city/22 highway. Meanwhile, towing capacity in this downsized ute is maxed out at 1,500 pounds with the proper equipment. As with its less tech-endowed sibling, the RDX SH-AWD with Tech Package sports such standard safety equipment as 4-wheel antilock brakes (ABS), traction and stability control, front and rear head airbags, front side-mounted airbags and front head restraint whiplash protection. This high-end trim also mirrors its brethren with daytime running lights, turn-signal-integrated mirrors, front fog/driving lights, high-intensity-discharge (HID) headlights and a remote antitheft alarm.